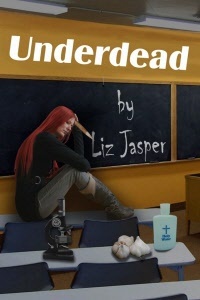 The fourth book in the Underdead series. Devious plotting going on here. I’d normally want to put a teaser in here, but I’m not a stage where I want to talk about the book I’m working on. I want to write it. I write curl-up-on-the-couch mysteries–the sort that make you giggle and forget a bad day. This, naturally, means that I write about vampires and murder. And when I’m not writing about vampires and murder (the Underdead books) I’m writing about demons (Crimson in the Very Wrong Fairy Tale). I love a strong heroine who, when life goes sideways, can muster up a sense of humor and have the courage to carry on (and, when necessary, the good sense to run fast in the other direction). I don’t know about you, but my life has not gone according to any known plan and I’ve never had the sort of adult life promised me by the TV shows I watched growing up. (Like living in a gorgeous loft and hanging out in coffee shops with friends. Dreamy sigh.) I taught and went to grad school and lived in tiny rathole apartments and went to coffee shops as a treat–to study and grade papers when my apartment seemed to close in on me.) But I loved it. Why is that? I am endlessly compelled to write about heroines whose lives go cattywampus in a way that makes them want to go back to bed and pull the covers back over their head. But they don’t. (Well, maybe they do for a bit, but eventually they rise up and grow and find a way to fight back.) And I love that. Why do I write paranormal? Because it adds something unexpected to the mix that keeps me guessing and entertained and laughing. I do a lot of plotting and mind mapping (drawing large branching things out on paper) before I write, because I like books that have more than one official genre going on (e.g., Underdead is a humorous cozy murder mystery with a love triangle, and vampires). I start with long plotting sessions with a writer buddy who loves the books and has a devious mind and the gift of straightforward honesty. When I get stuck, I go on hikes and work them through. Or I talk through plot tangles with my sister (typically this means we we hike together and she entertains herself by making me talk on the uphill parts). And then I lock myself somewhere and write. And I do things like clean the bathroom with a toothbrush to procrastinate motivate myself to write more. And then I edit. And write. And edit. There is a lot of chocolate consumed when I write. I’m not sure if the expectation now was for me to pass the hop on to two more writers, but since she forgot to tell me that point, I’m going to NOT keep the hop going forward and instead direct you BACKWARDS. So go check out Cindy Sample if you haven’t already, and then check out Diana Orgain and then Heather Haven and…. 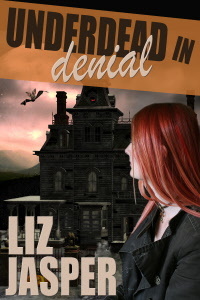 This entry was posted in Uncategorized and tagged cindy sample, diana orgain, funny books, heather haven, liz jasper, writers. Bookmark the permalink. Hi Trace, thanks for stopping by with good humor. Have a head cold (Bleah) but now also a smile on my face. Thanks!